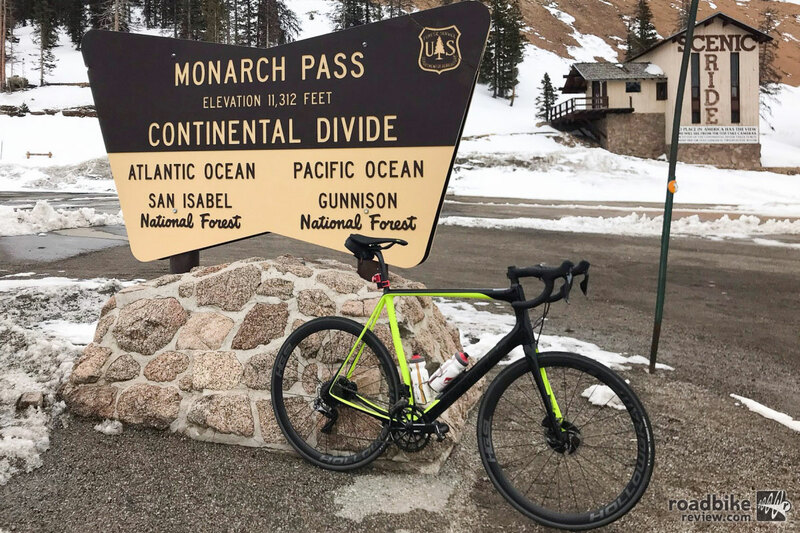 The Cannondale Synapse Hi-Mod Disc Dura Ace Di2 was up for just about any adventure, including some early spring high country riding in Colorado. 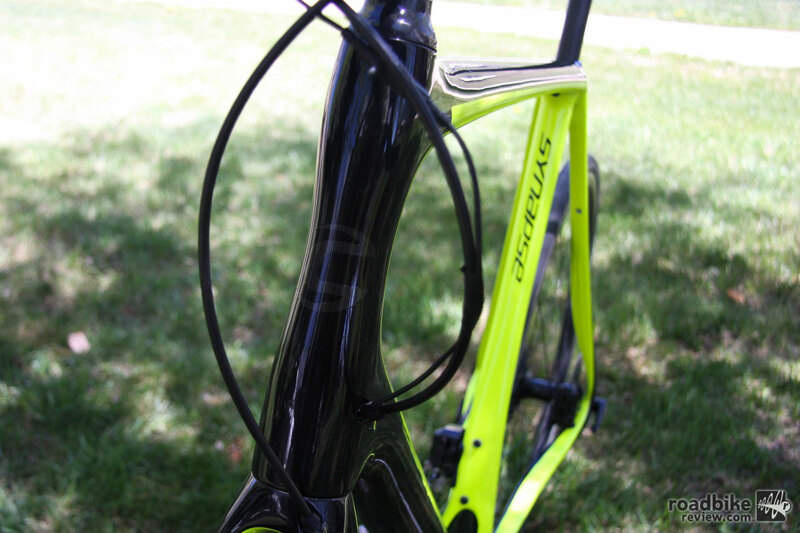 The Synapse is Cannondale’s offering in the endurance race bike (not just endurance bike) segment. The Hi-Mod Disc Dura-Ace Di2 version, as you’ve likely guessed, is the no holds barred top shelf everything disc brake-equipped model that has an eye watering $10,000 price tag. And while Synapse is not a new platform for Cannondale, this latest version makes some impressive leaps forward compared to its predecessor. Tops on that list is weight (or lack thereof). This latest Synapse Carbon frame is claimed to be 220 grams lighter than the outgoing version, and it has a total claimed frame weight of just 950 grams (size 56cm). The non-driveside chainstay is larger than the driveside in order to deal with disc braking forces. 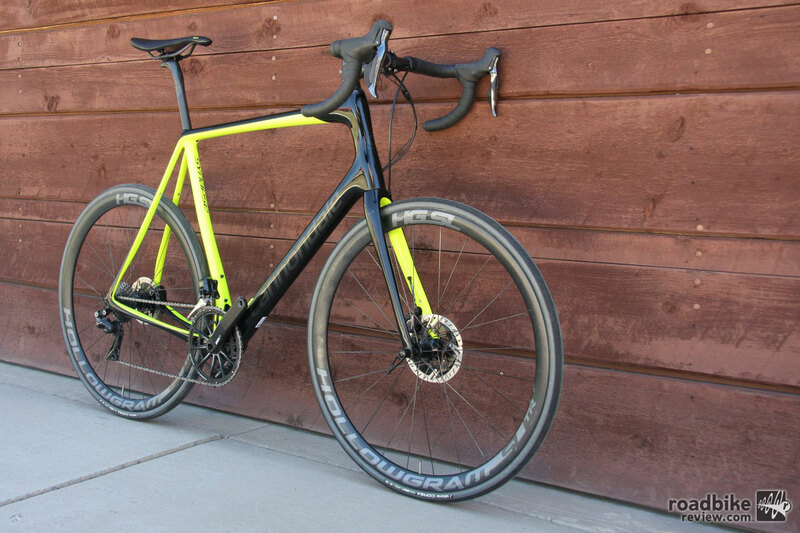 Cannondale also says stiffness has increased by 9.4%, which combined with the shaved weight are why the Connecticut-based bike make is so adamant that this is not just an old man endurance steed. Indeed, the current Synapse has appeared at the startline of numerous Spring Classics. Other notable features include what’s become the industry standard of 12mm thru-axles and flat mount disc calipers, along with brake hoses that stealthily travel inside fork and frame for a smooth, clean look. There’s also a veritable two-faced rear triangle, where the non-driveside chainstay is nearly 20% larger than on the driveside. 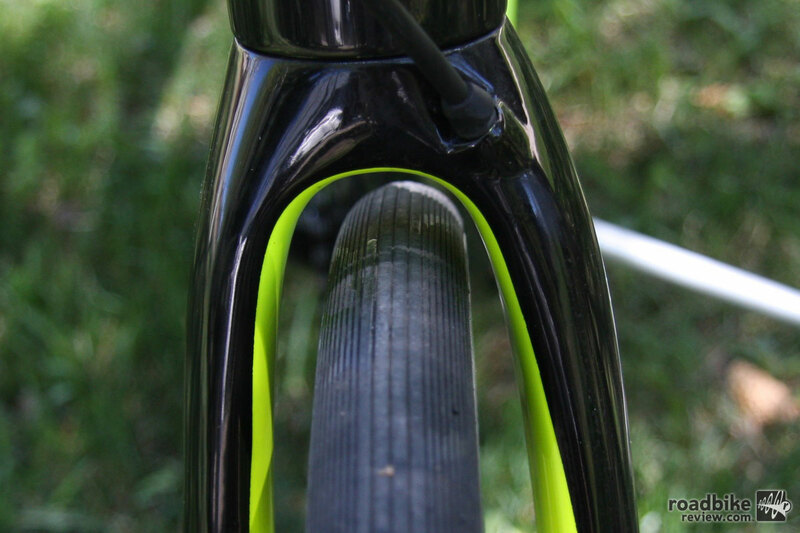 There’s similar asymmetry in the fork, which in both cases is done to resist flex during hard braking. The integrated seatpost clamp means more exposed seatpost. This Synapse also employs size-specific construction, where every frame size get its own carbon layup and tube dimensions. 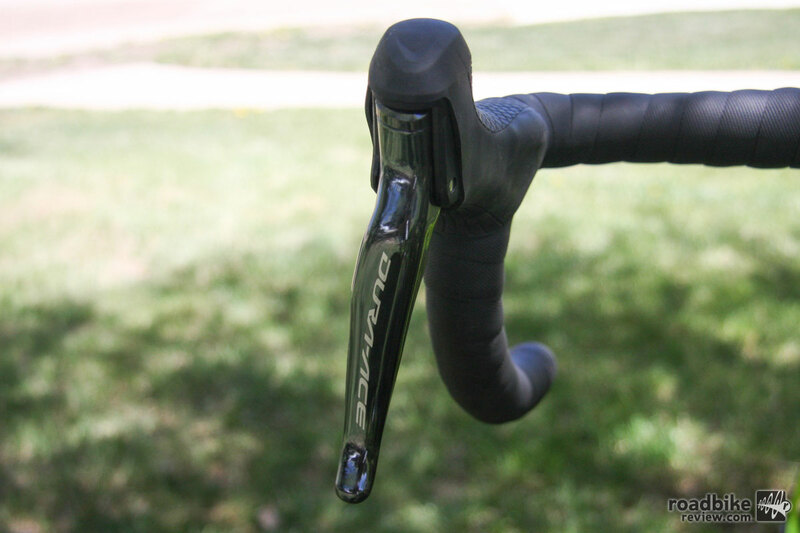 Additionally, Cannondale utilizes three different fork steerer and headtube diameters with three different fork offsets, again to ensure that every rider gets the same ride feel and handling, regardless of frame size, which include 48, 51, 54, 56, 58, and 61cm. What the Synapse frame doesn’t have is any moving “suspension” parts (think Specialized Roubaix’s Future Shock or Trek Domane’s IsoSpeed Decoupler). 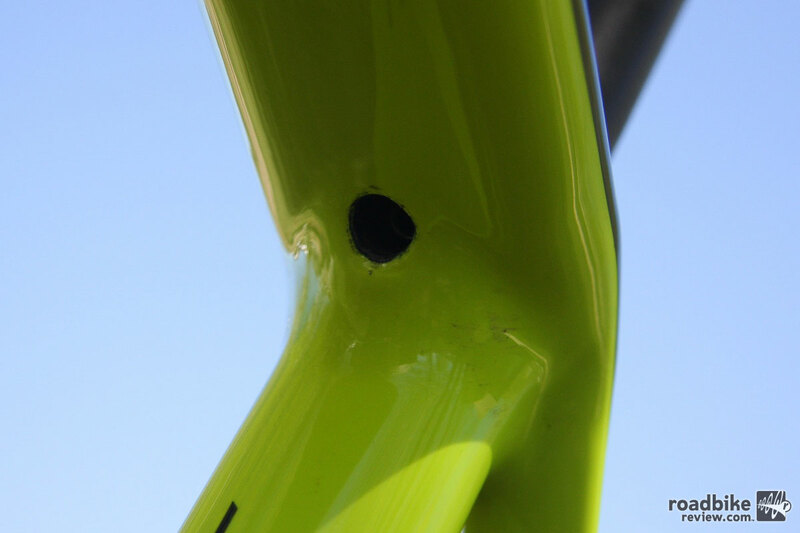 Instead Cannondale’s endurance race steed relies on frame and seatpost deflection, the latter being a slim 25.4mm with a hidden seatclamp that increases the amount of post extended above the top tube. Adjustment of seatpost height means playing around in that hole. 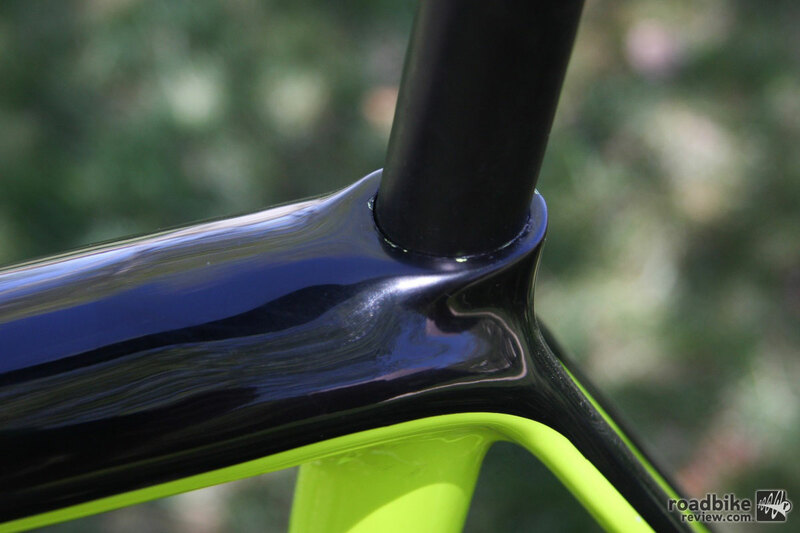 Seatpost deflection is coupled with the frame’s SAVE micro suspension (really just rear end give), which is claimed to deliver 3mm of bump absorbing movement. Ride smoothing is further enhanced by fast rolling Vittoria Corsa 700x28c tires, though adventurous types will be pleased to hear that there’s space for up to 32mm rubber if you’re so inclined. 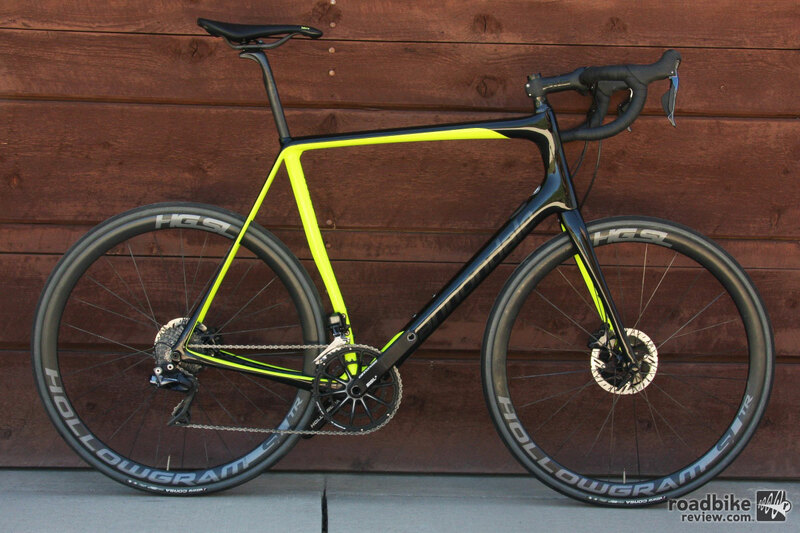 All told there are 11 bikes in the Synapse Carbon family, plus four aluminum frame models. All but one come stock with disc brakes. Prices range from 10 large for the Dura-Ace Di2-spec’d bike that’s reviewed here, to a $1000 aluminum frame model with a Shimano Sora drivetrain. Our test bike in a size 61cm weighed a reasonably light (for a disc brake-equipped bike) 16.2 pounds. Actual weight for this size 61cm was 16.2 pounds with tubes. Up, up and away on the Cannondale Synapse. 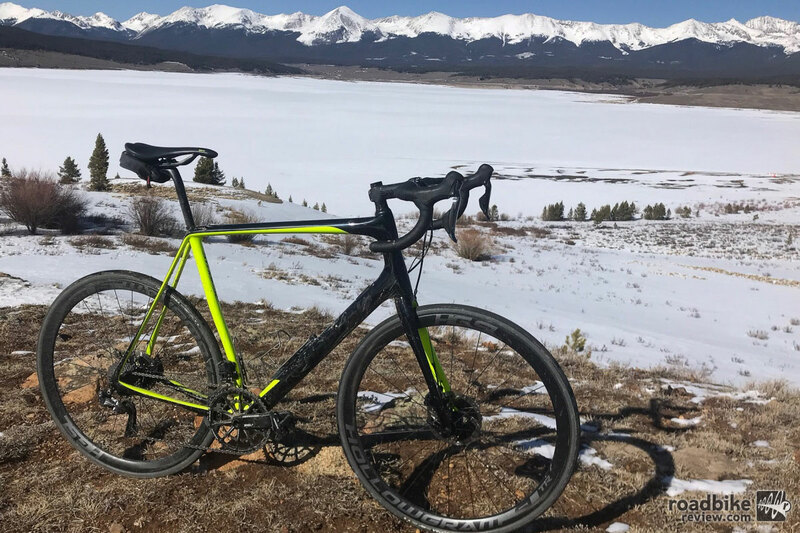 Whether you should choose the Cannondale Synapse over another option among the current crop of racy endurance bikes really comes down to intended use and riding style. Having also spent time on most the mainstays in this category (Specialized Roubaix, Trek Domane, Giant Defy) I can honestly say they are all good bikes with strengths and weaknesses. For my money, I’d place the Synapse near the top of heap if racing (or fast group riding) was a priority, and you weren’t planning to spend a ton of time venturing way off the beaten unpaved path. I write this because the Synapse is a fantastically stiff and efficient machine, but also not the most forgiving in this class, an honor I’d split between the Roubaix and Domane. Yes, the Synapse will take the sting out of choppy pavement, but potholes will remain potholes and rough road will still be rough. For for those keeping score at home, that’s 23cm of headtube. That’s not to say there’s no comfort on offer here. The Synapse’s length headtube (23cm on the size 61 frame) and rangy 1029mm wheelbase keep things stable and somewhat upright. 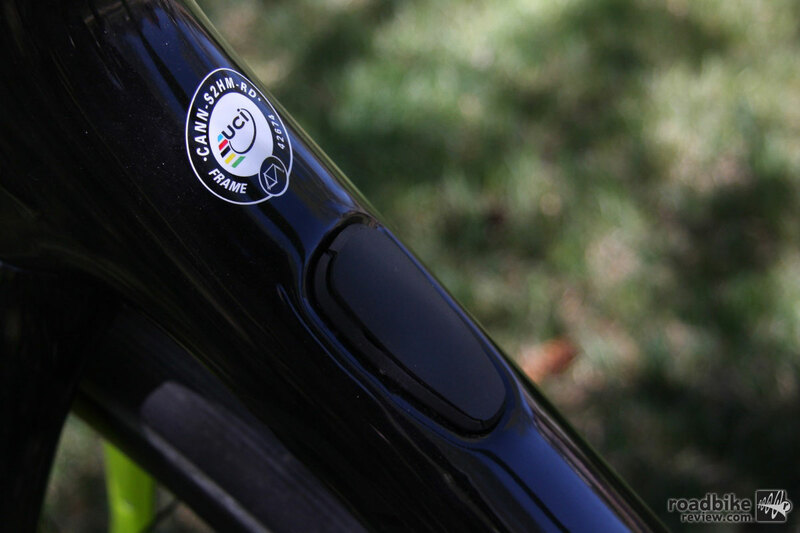 And unlike the Roubaix or Domane, the frame has no moving “suspension” parts, which purists will certainly appreciate. The Synapse — comparatively speaking — is also wonderfully light. The bike tested here registered 16.2 pounds on our garage scale, while a similarly high zoot spec’d Roubaix we have in for testing was a full 1.7 pounds heavier. That’s a significant difference when you’re shelling out 5 figures for two wheels. 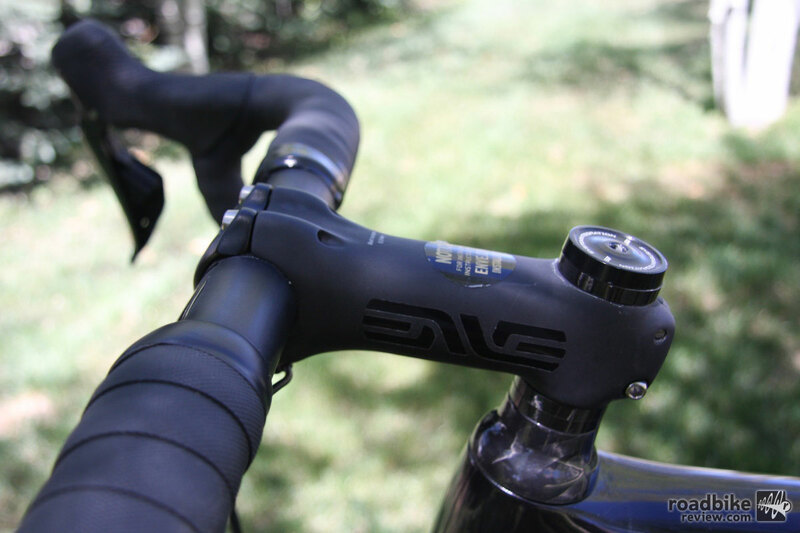 ENVE carbon gets the nod for bar and stem duty. I do, however, have to deduct points for the integrated seatpost clamp/seatpost, which I found incredibly tedious to adjust and prone to slippage if not slathered with excessive amounts of carbon paste. I get the rationale of maximizing exposed post for the sake of comfort, but wonder if the PITA factor is really worth the small gains in deflection. Of course once you get your saddle height dialed this shouldn’t be a huge issue, which is why my bottom line on this bike is an enthusiastic thumbs skyward. The frame is light, stiff, and incredibly responsive. The bike is reasonably comfortable on all but the roughest roads. And handling is much closer to race bike snappy than endurance bike sluggish. And while that bong-sized headtube might scare some away, overall rider position is plenty aggressive for the general riding population who are seeking to go fast, but not have to be a yoga master to hang out in the drops. 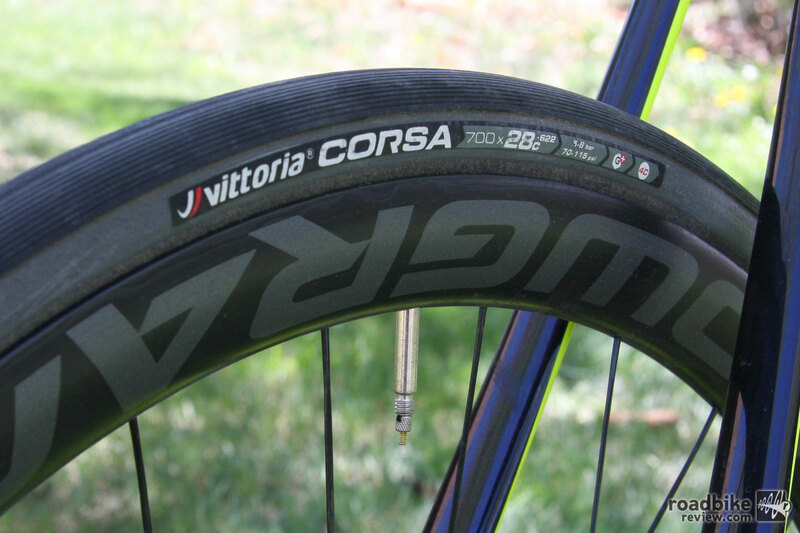 Smooth rolling Vittoria Corsa tires are a nice touch. Finally, props to Cannondale’s Hollowgram SL Carbon Disc wheels, which look great, come tubeless ready, have a category-appropriate 19mm internal rim width, and are 35mm deep with DT Swiss Aerolite bladed spokes, reminding its rider that this might be an endurance bike but its true talent is going fast. 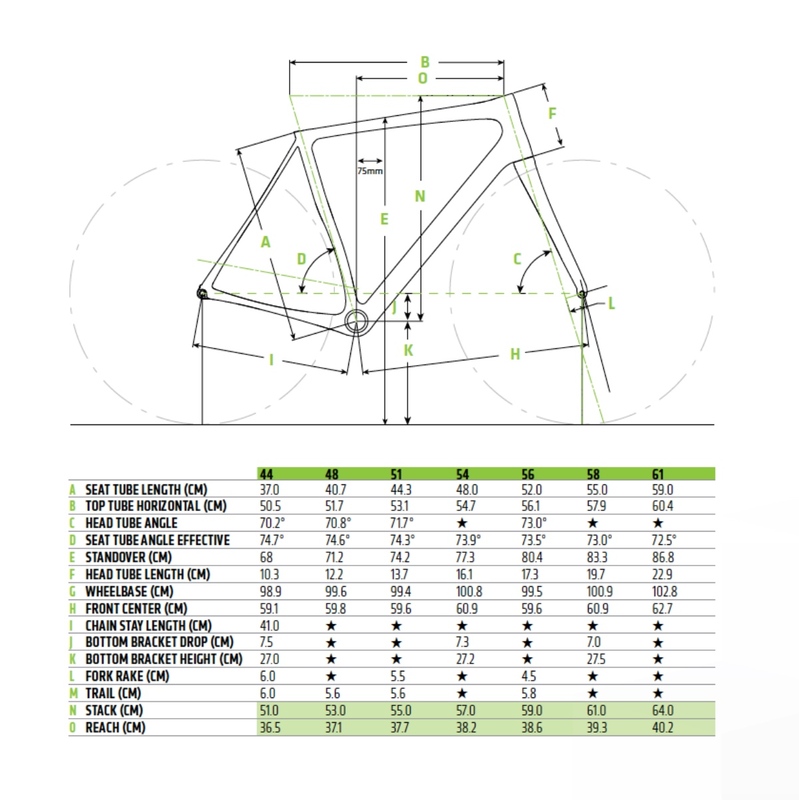 Full geo chart for the Cannondale Synapse Hi-Mod Disc Dura Ace Di2. The bike comes stock with 28mm tires, but there’s room for up to 32s. 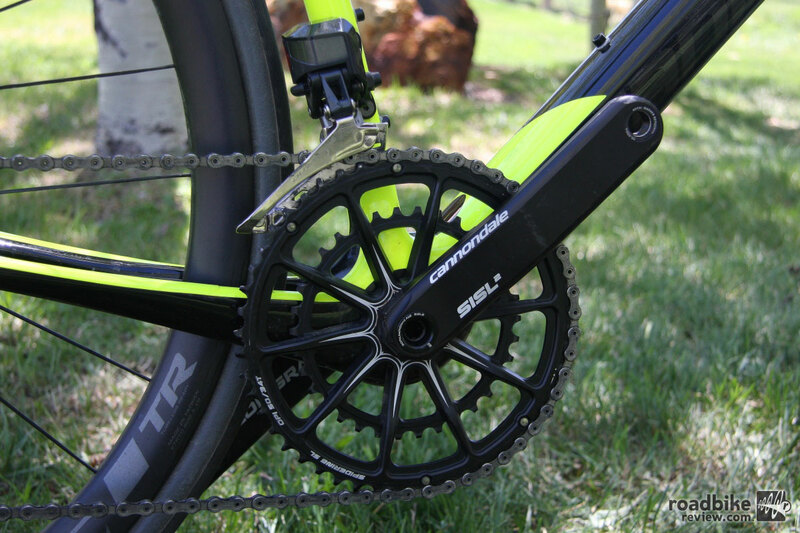 Cannondale spec’s its own lightweight HollowGram SiSL2 crankset. 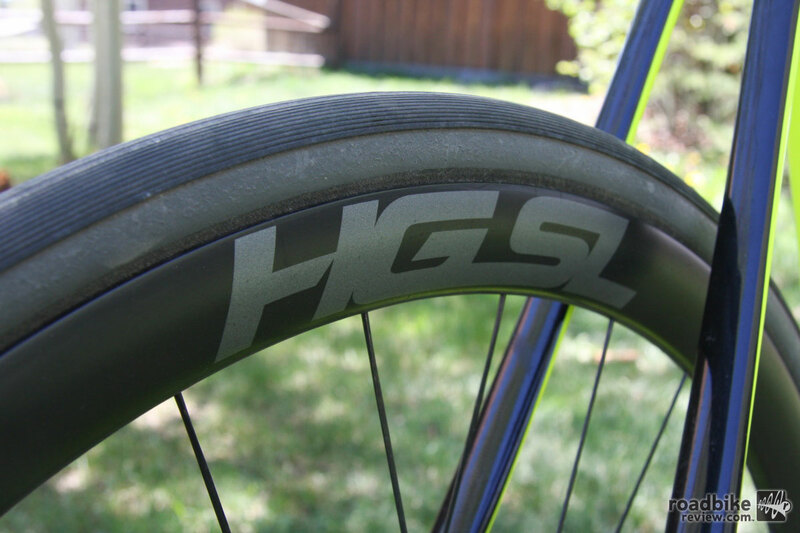 The Cannondale HollowGram SL Carbon wheels are tubeless ready and 35mm deep for a little extra aero advantage. 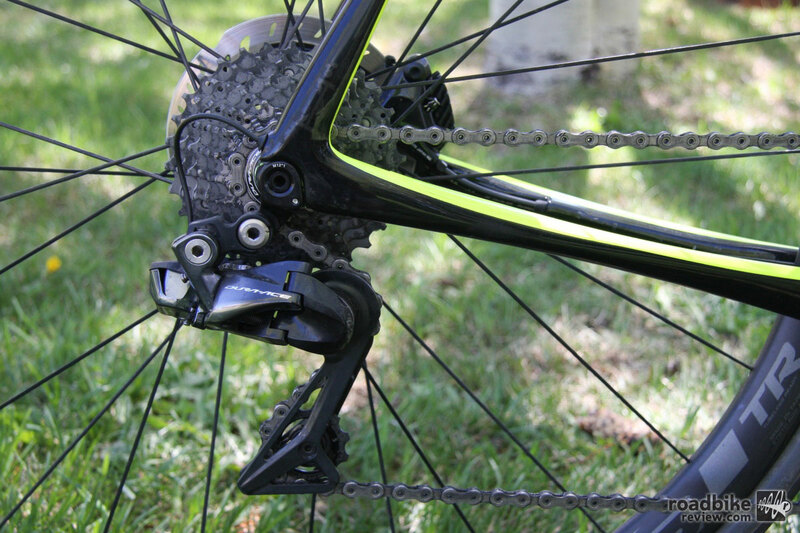 Shifting and braking by the best-in-class Shimano Dura-Ace Di2. The Di2 junction box is easy to access, located on the topside of the downtube. 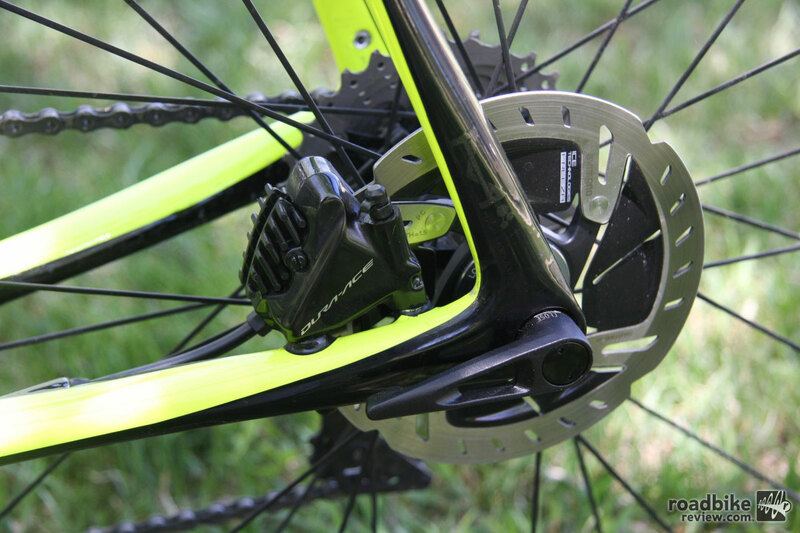 The Synape uses industry standard 12mm thru-axles and flat mount disc calipers. 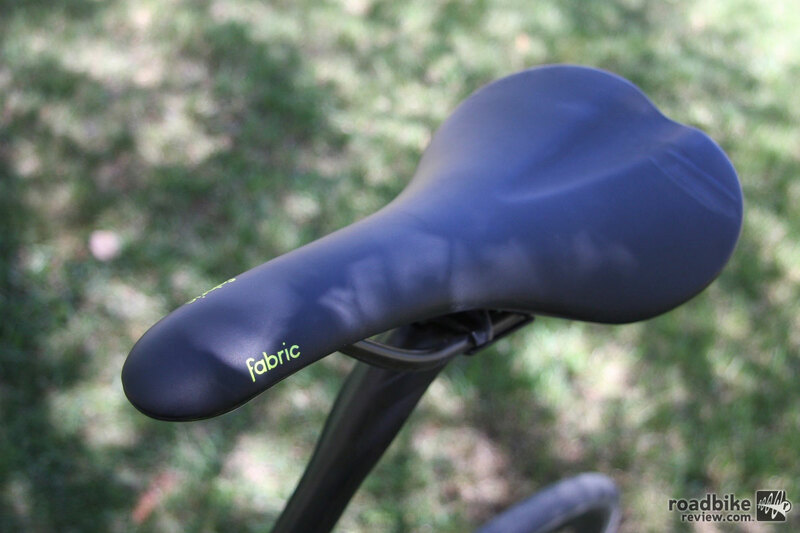 Saddle is by Cannondale partner brand Fabric. It’s a good enough looking bike, but nothing we’d swoon over.